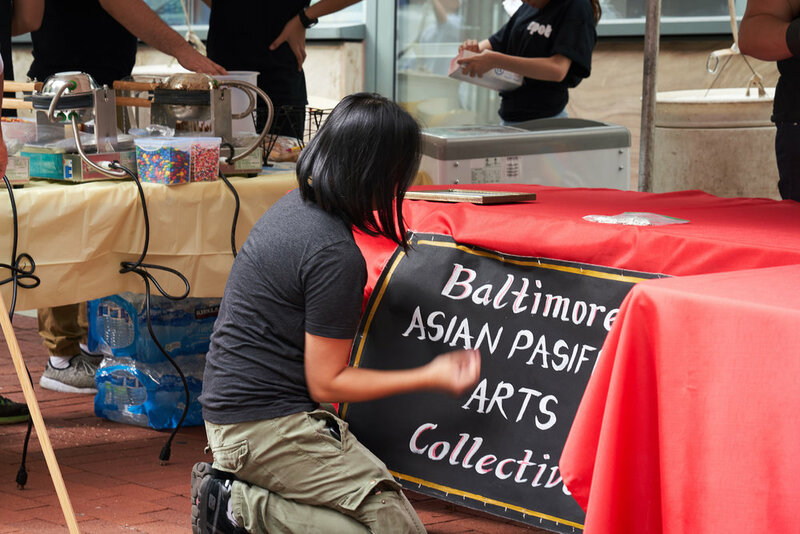 This Saturday, October 22, Baltimore Asian Pasifika Arts Collective (BAPAC) appeared at the Charm City Night Market for a night of food and art! 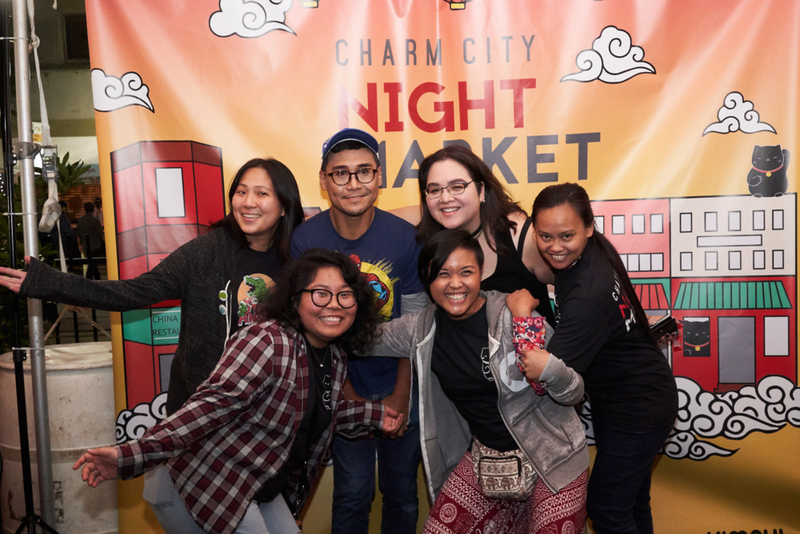 It was an evening filled with firsts: This was our first ever public appearance and performance as an organization at Baltimore’s first ever Charm City Night Market Festival (hosted by Chinatown Collective, also a new organization in Baltimore). The event began with large crowds wandering onto Lexington and Park almost immediately. Within the first couple of hours, the streets of Baltimore’s Historic Chinatown were bustling with music, excitement and curiosity. Momo Nakamura performing in Reflections on Identity at the Charm City Night Market. Photo courtesy of Corey Jennings. We kicked off our evening with a series of short performances on the Night Market’s secondary stage called Reflections on Identity. The thirty minute set began with an original piece created and performed by our Co-executive Director, Mohammad R. Suaidi, from his devised collaboration with artist Naoko Maeshiba called da da da Pas de Deux. Following his performance, actors Jennifer Knight and Momo Nakamura along with Catrece Tipon (Artistic Producer) presented a staged reading of a ten minute play entitled The Day America Sank Beneath the Sea written by Sam Callanta (Projects Manager). Co-executive Director Cori Dioquino brought the show to a playful close with her re-enactment of “Tin Tin and the Kapre” - a re-imagined telling of a Filipino folktale written by Filipino-American playwright Katelynn Kenney for her play Void. Dusk at the Charm City Night Market. Photo courtesy of Jennifer Knight. It was an incredible evening for all of us here at BAPAC! It was truly empowering to see so many AAPI cultures and identities represented through food, music, performance and fashion. We loved meeting new people and supporting our brother and sister organizations throughout the evening! Most importantly we truly loved meeting all of you! It was our pleasure to formally introduce ourselves to our community and share with you our goals as we continue to build our organization in the months ahead. We cannot wait to share with you more! If you are interested in learning more about upcoming programs, please join our mailing list! See you all soon and thank you for making our first event so meaningful. Our incredible team working hard at our table and tent. 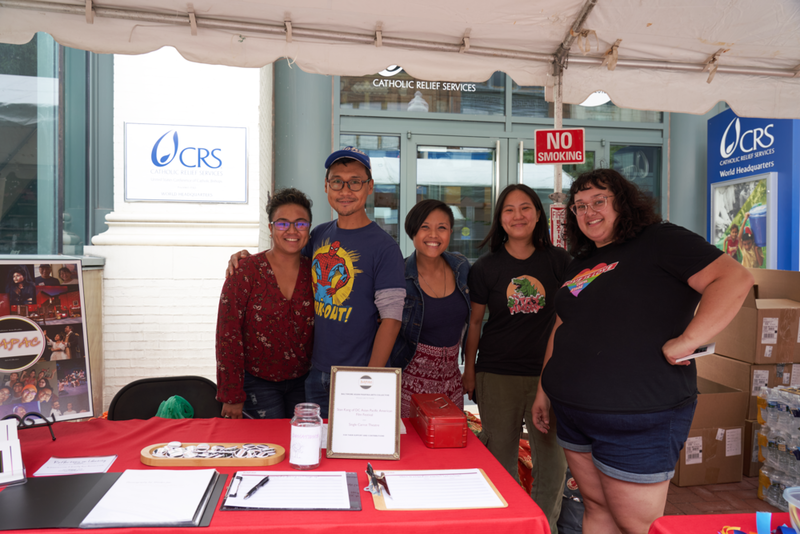 From L-R: Catrece Tipon (Artistic Producer), Mohammad R. Suaidi (Co-executive Director), Cori Dioquino (Co-executive Director), Mandy Yu (Volunteer), Cara Hinh (Education and Community Outreach Director). Photo courtesy of Daniel Ahn. Staff member Mandy Yu fixing our table sign. 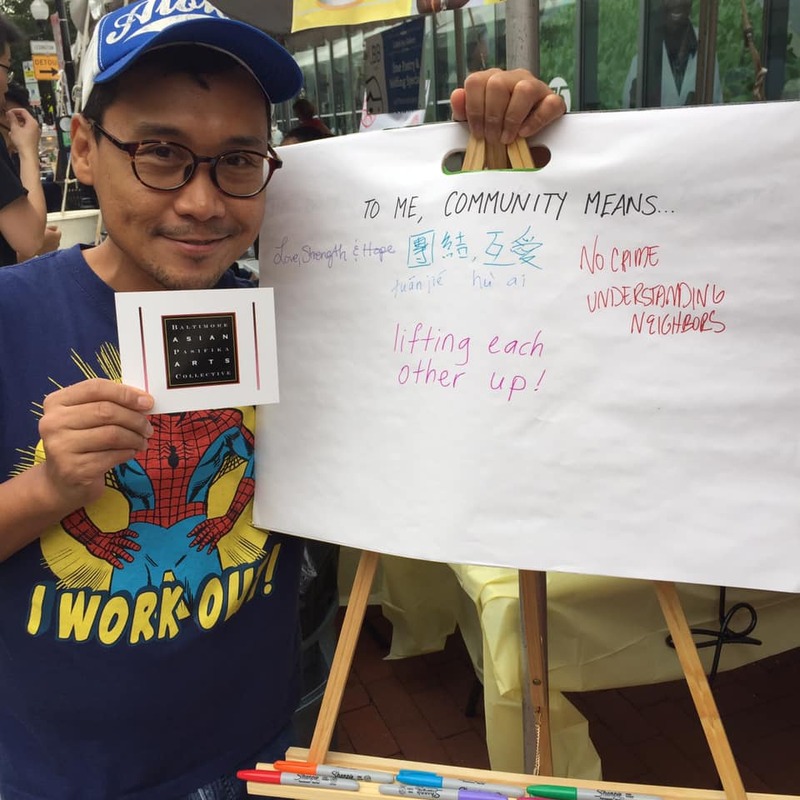 Co-executive director Mohammad R. Suaidi leads by example and writes what community means to him on our community board. Photo courtesy of Mandy Yu. Visitors making their own bookmarks with our Education and Community Outreach Director, Cara Hinh. 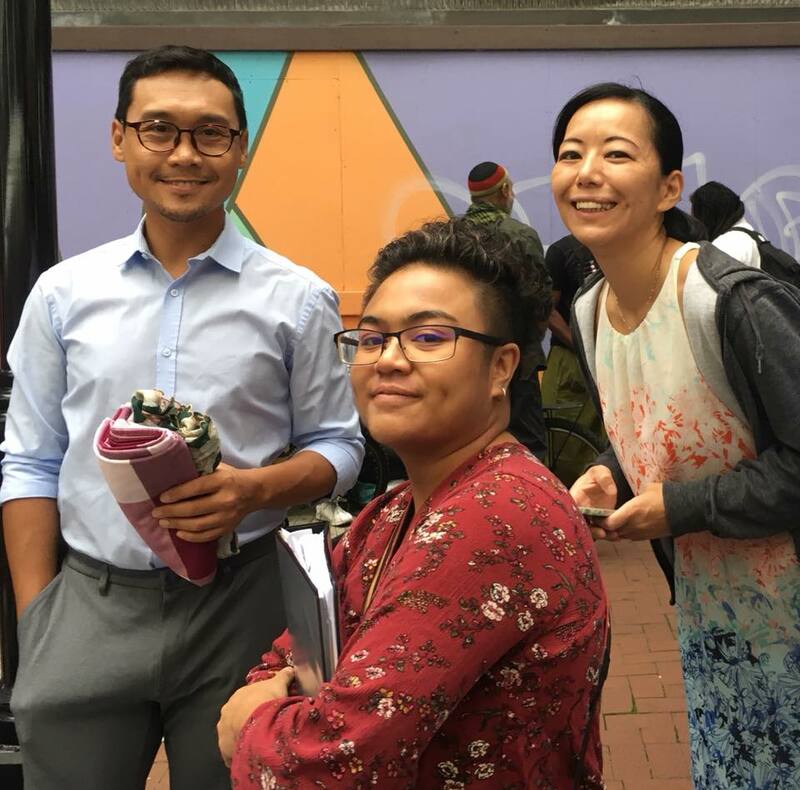 Mohammad R. Suaidi (Co-executive Director), Catrece Tipon (Artistic Producer) and Momo Nakamura (Performer) at the Charm City Night Market waiting to perform. Top L-R: Jennifer Knight (Performer), Mohammad R. Suaidi, Cori Dioquino. Bottom L-R: Catrece Tipon, Michael Elsroad, Momo Nakamura (Performer). Photo courtesy of Momo Nakamura. Photo courtesy of May Chung. 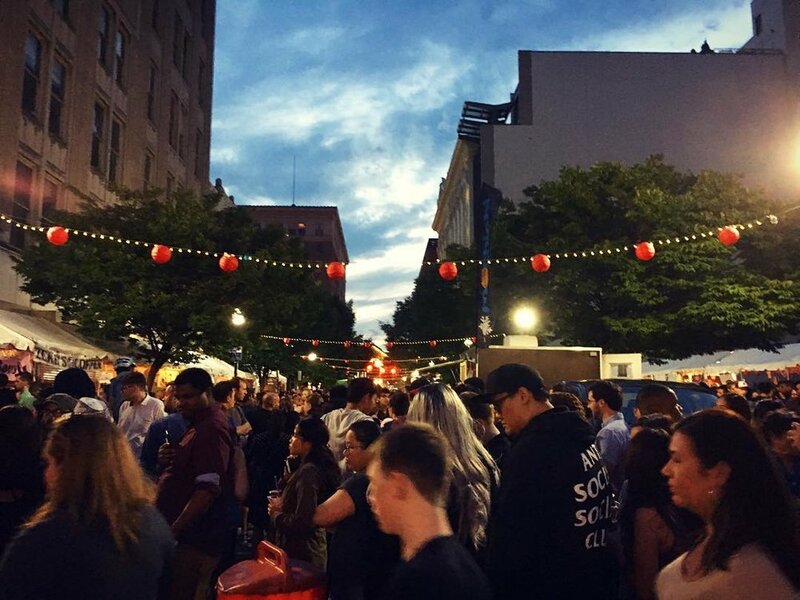 Crowded streets of the Charm City Night Market. Baltimore Dance Crews Project’s Senior Team performs at the Charm City Night Market. BAPAC Co-Executive Director Cori Dioquino with friend and choreographer Cynthia Chavez, Executive Artistic Director of BDCP. 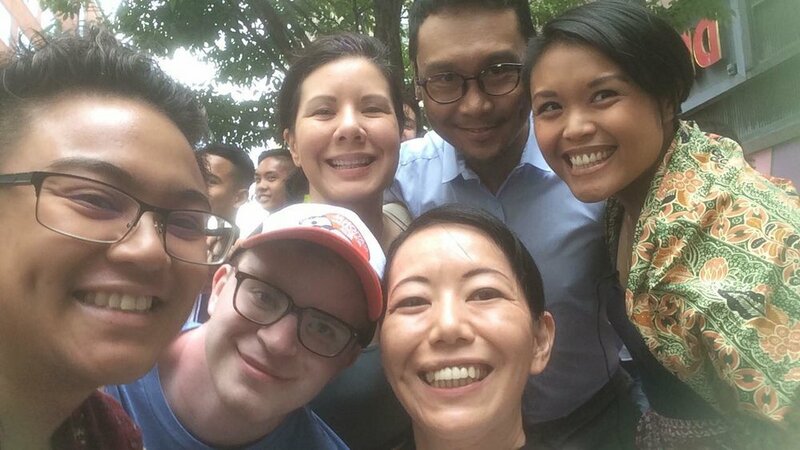 From L-R: Mandy Yu, Mohammad R. Suaidi, Sam Callanta (Projects Manager), Donna Ibale (Managing Director), Marela Kay Minosa (Operations Manager), Cori Dioquino.